Which Wednesday Do You Prefer? 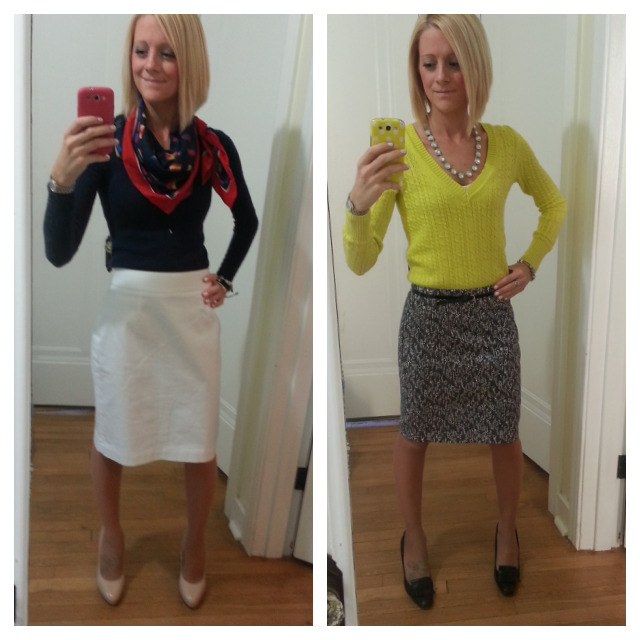 So, the left was my outfit today, and the right was my outfit last Wednesday. Today: Sweater, Gap, thrifted for $4. Skirt, Banana Republic basic pencil skirt (I have it in three colors) bought in the fall last year for $9 final sale (originally retails for $89.) Nautical scarf that I LOVE was thrifted for $1! Shoes are Elle that I found at a local consignment shop for next to nothing! Last week: Neon yellow cable-knit V-neck from American Eagle, found at Salvation Army for $2. Skirt, Express, thrifted for $4. Shoes are my Isaac Mizrahi from Target (repeat), thrifted. Necklace was my $7 Macys find!